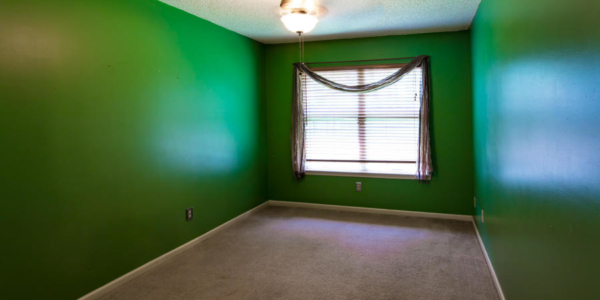 Selling with bright colored walls. 120 days on market unsold. 10 days SOLD after staging. 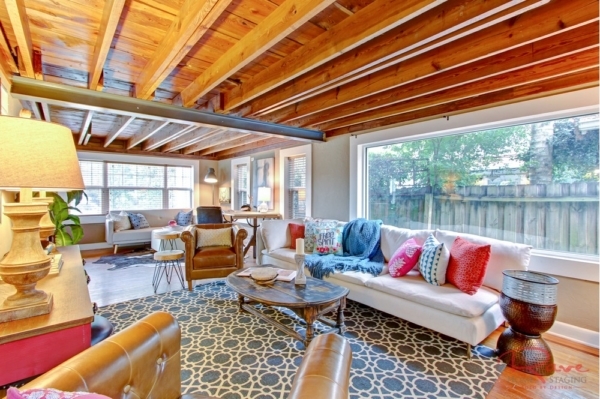 Home Staging overcomes cosmetic flaws and shows potential. 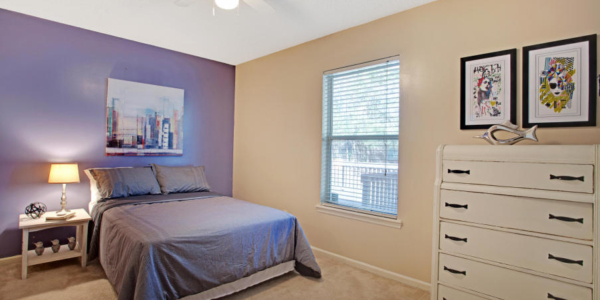 As professional home stagers, we are often asked the question on whether or not that bold room color choices should be painted over with something more neutral. The answer is nearly always a resounding “YES!”. 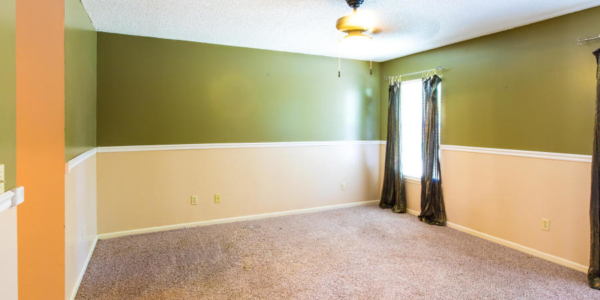 There are times when the seller either doesn’t have the time or the funds to paint, and times when they simply refuse to do it. Whether it is because they simply don’t believe that it will make a difference, or they don’t want to do the work, there are times when they tell us, the home stager, “no.” When that happens, but they are still willing to stage, it becomes our job to find a way to minimize the impact. 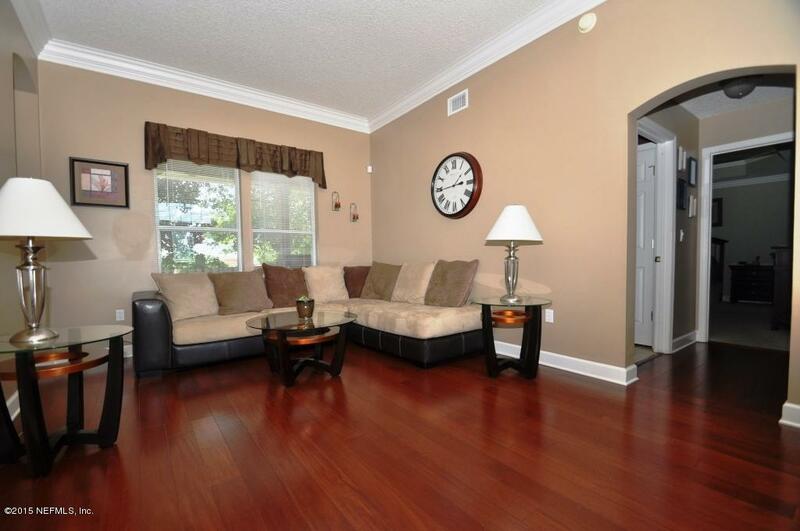 Let’s take a look at 1739 Nettington Ct, in Jacksonville, FL. 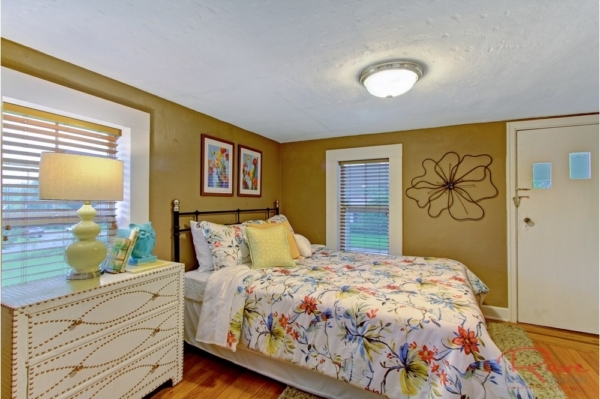 This charming home, located in Sutton Lakes, is in a sought after part of town. Since we are living in a seller’s market, it seems unlikely that a well priced 4 bedroom, 2 bath home would sit on the market for over 100 days. Still, that’s what was happening here. 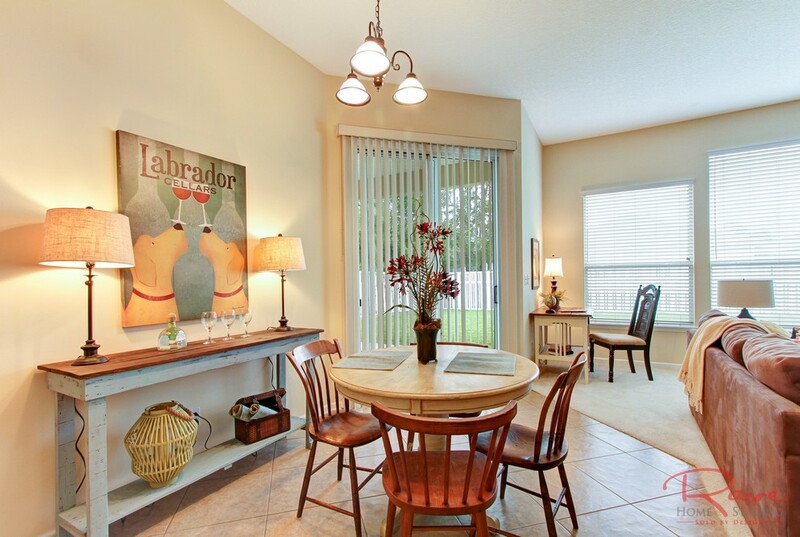 After sitting, with no offers, the seller contacted Rave Home Staging and we created a plan to get the home sold. 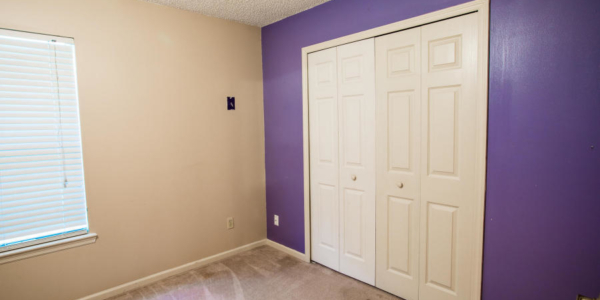 Unfortunately, as I mentioned in the intro, the seller was very clear that despite the best option being to paint the boldly colored walls, he wasn’t going to do it. He didn’t want to spend the time, energy, or money, painting. 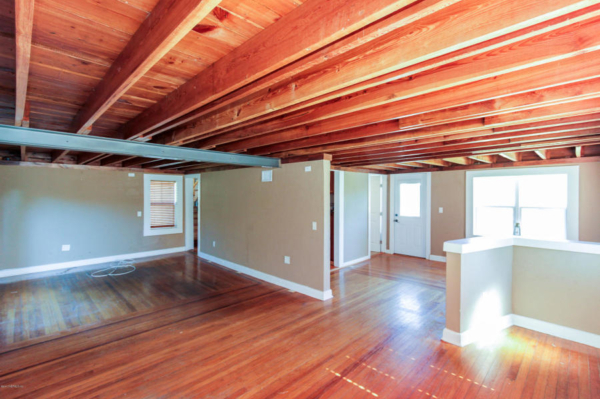 This home had been a rental property. He wasn’t emotionally invested, and just wanted it sold. The photos in the slide show below are the actual photos used in MLS. Let’s be realistic. With most home buyers looking online prior to viewing a home in person, how enticing is this property? 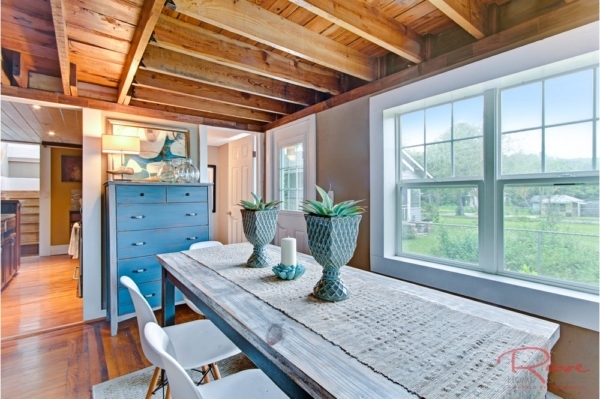 On a scale of 1-10, how likely would buyers feel like this home is move-in-ready? 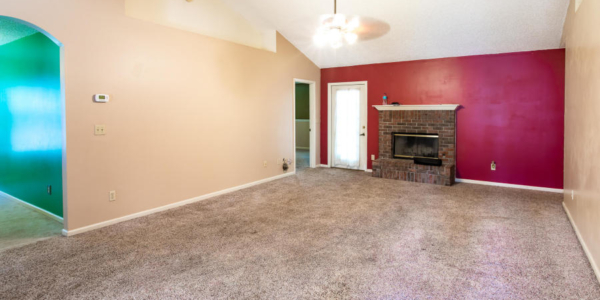 How likely are they to pay list price, or close to list price? 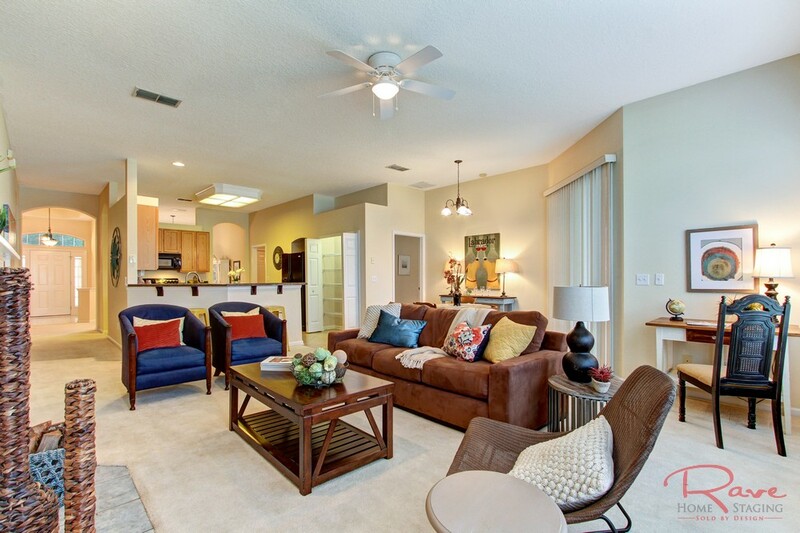 Let’s take a look at what this home looked like after staging. 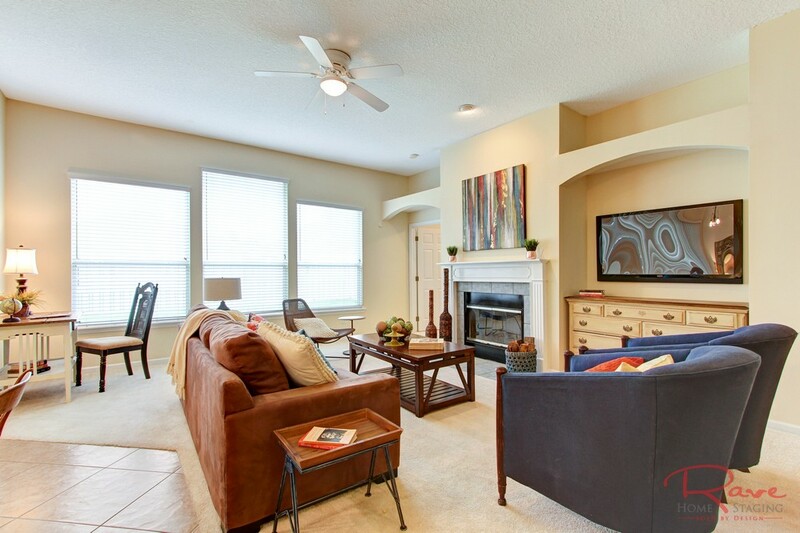 Our staging team did nothing but bring in new furniture, art, and accessories. 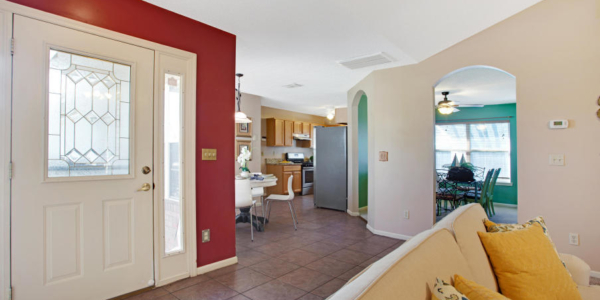 With all of that, however, we managed to style the property so that potential buyers could look past the bold colors and imagine a life in the home. 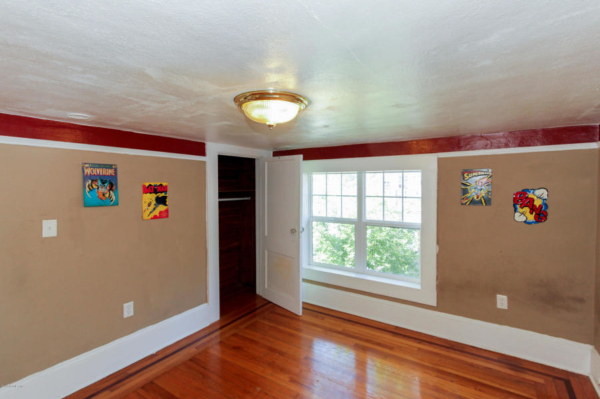 Perhaps they will still paint when they move in, but now they are able to see the space as a living room, dining room, and bedroom, instead of just a series of bold choices that they would need to correct, costing them time, energy, and money. The results were nothing less than spectacular. 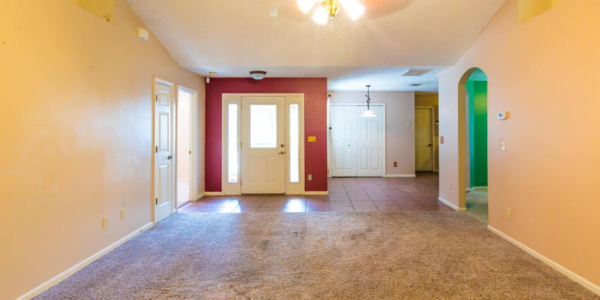 Within 10 days the seller accepted an offer. 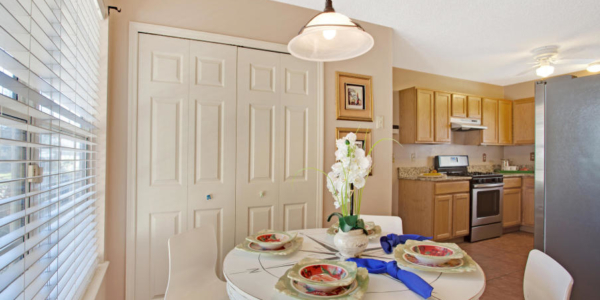 The property is now moving through the escrow process and will close in January. After what amounts to 4 months of time on market, it’s long past time for this home to welcome new owners. It’s also long past time for the seller to rid the stress of a mortgage payment and maintenance costs for a house sitting empty. You get what you pay for. 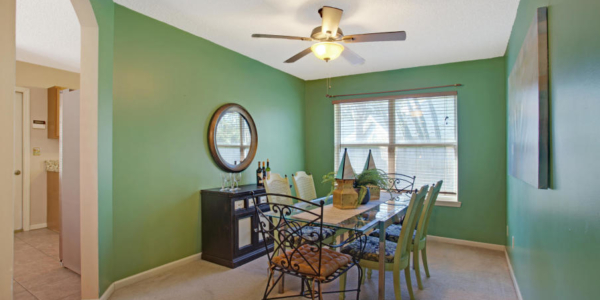 Cheap home staging can cost you thousands! 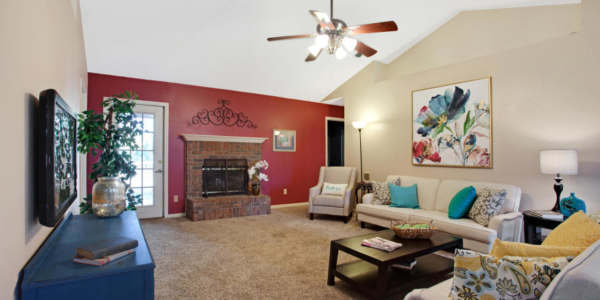 Why the cheaper home staging company can often cost significantly more money. In any market, there will competitors who seek to win business by offering a product or service at a lower cost. 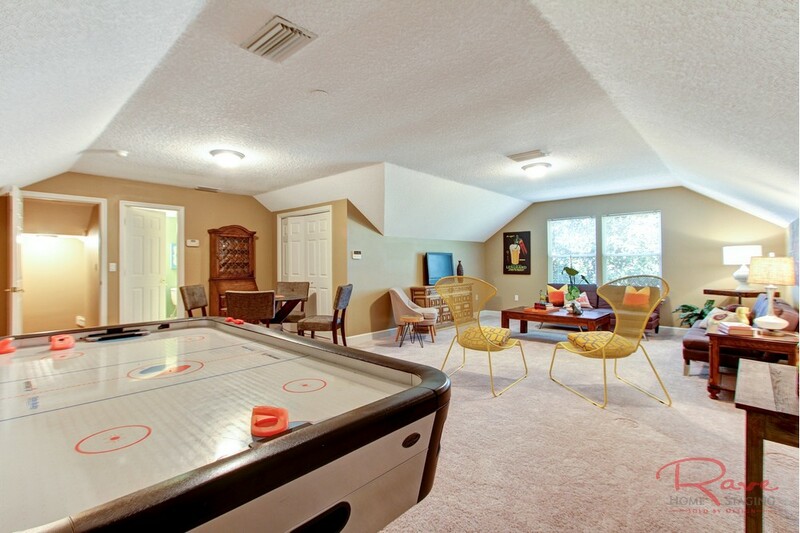 The question is, is the value of your home really something you want to gamble with? 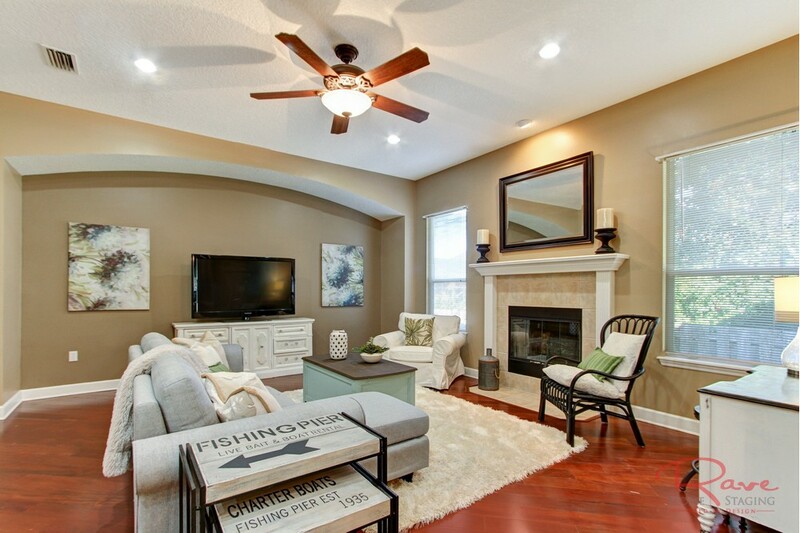 Too often, sellers believe that there isn’t a difference between staging companies. I mean, it’s just furniture, right? 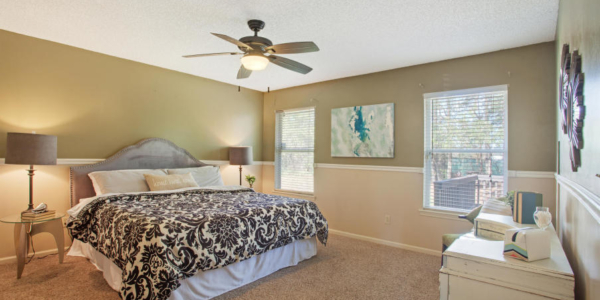 Let’s check out some of the homes, staged by another staging company, that we’ve had to “clean up” lately. 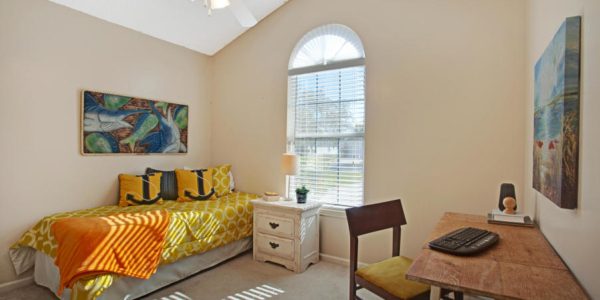 This MLS photo, from an executive home in Julington Creek Plantation, was staged by a “budget company” who only staged a few rooms in the home. (Thank Goodness!) 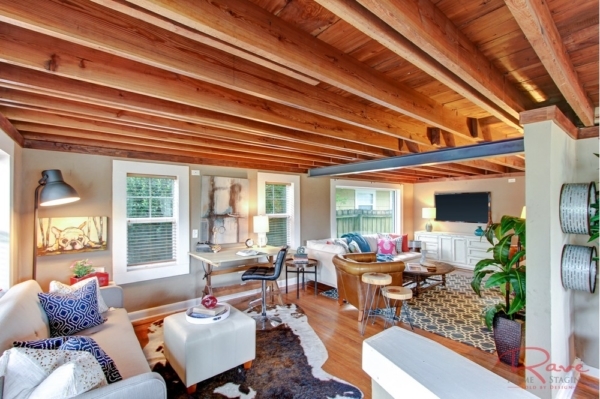 While the homeowners previously believed staging was a good idea to help sell their home, they left this experience with a sour taste in their mouth. 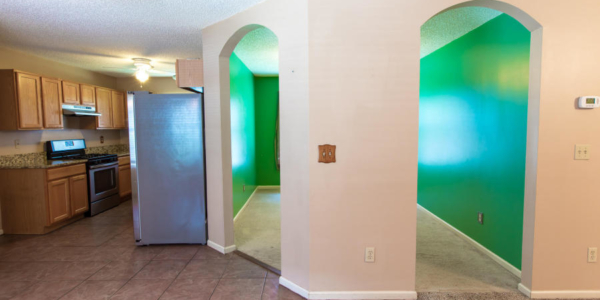 After several months on market, with no activity, they fired the stager, and the listing agent and found a Realtor who knew that it wasn’t the home, it was the staging that was sub par. 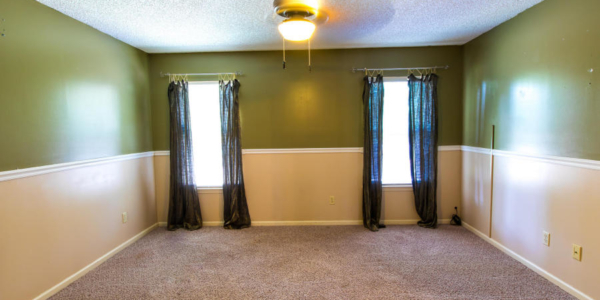 Before I show you Rave Home Staging’s photo of this same room, let’s just discuss why this staging should not be considered acceptable by any Realtor or Homeowner. The plastic is still on the lamp shades. There is no solid focal point to the space. There are so many things going on, including an overly bushy ficus tree, drawing your eye away from the fireplace, that there is no real place to look. 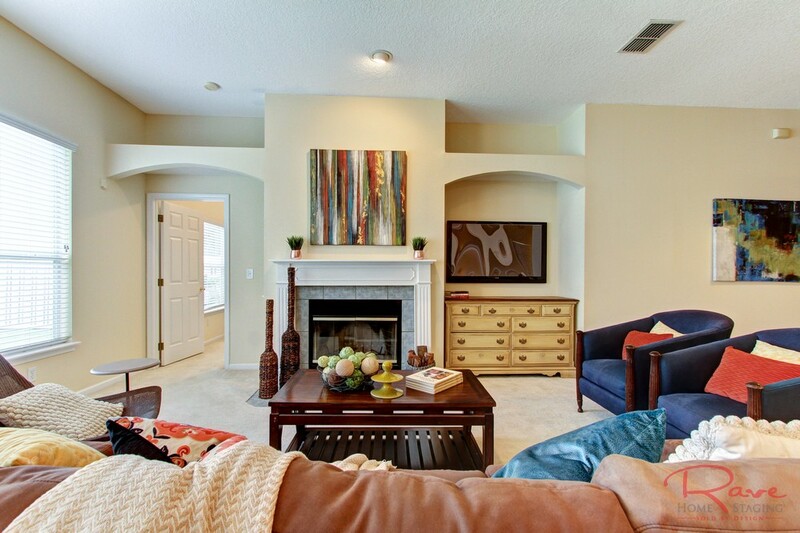 The furniture, art, and accessories used in this space, do not meet the demographics of the potential home buyer. Remember, I said this was an EXECUTIVE home. Does this scream executive to you? 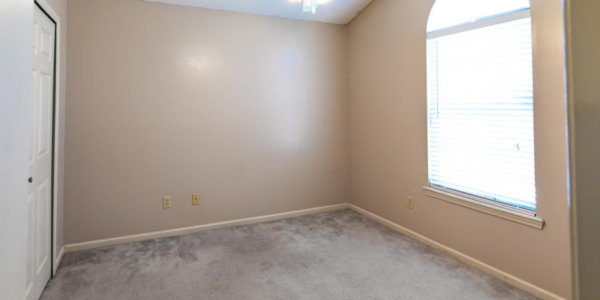 There is not enough seating in this room for the family that would live in the home. 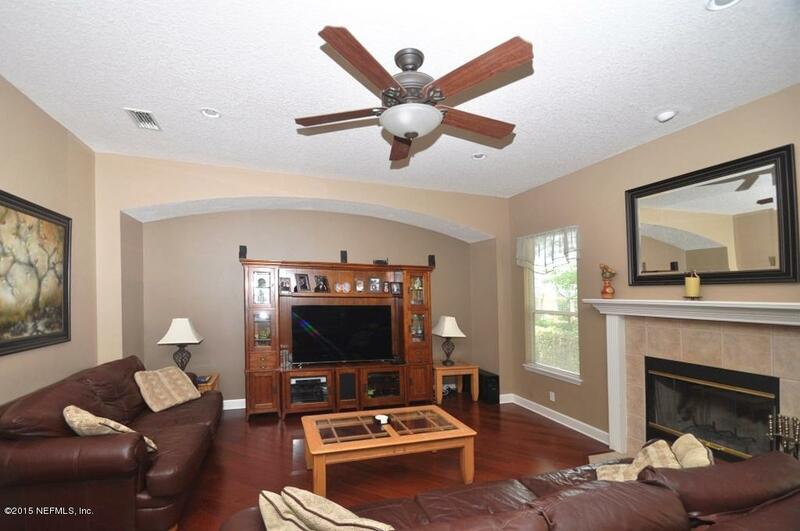 While you can’t tell from this photo, or the information I’ve provided so far, this is a 4 bedroom home. This is the only living room. While you may not have known that, the stager did. 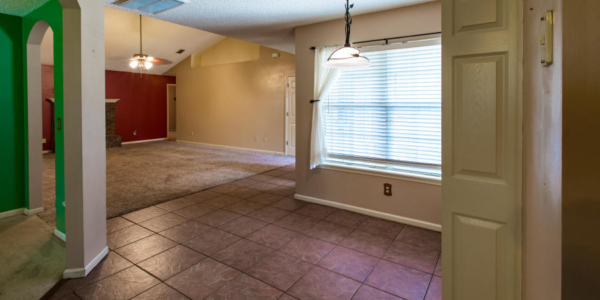 If you had the income to afford this house and this was the only living space in a 4 bedroom 2600 sqft house, do you feel like it would be optimal for your family? Now. 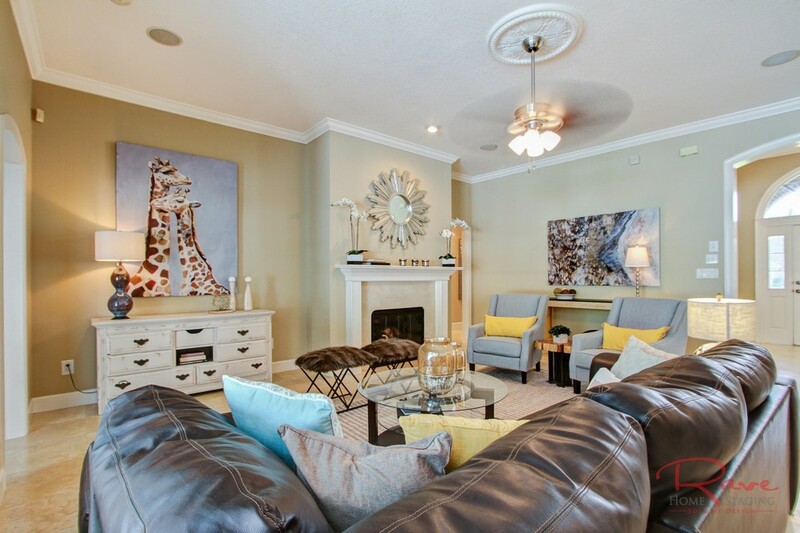 Let’s discuss how we approach home staging, and how we changed the space. 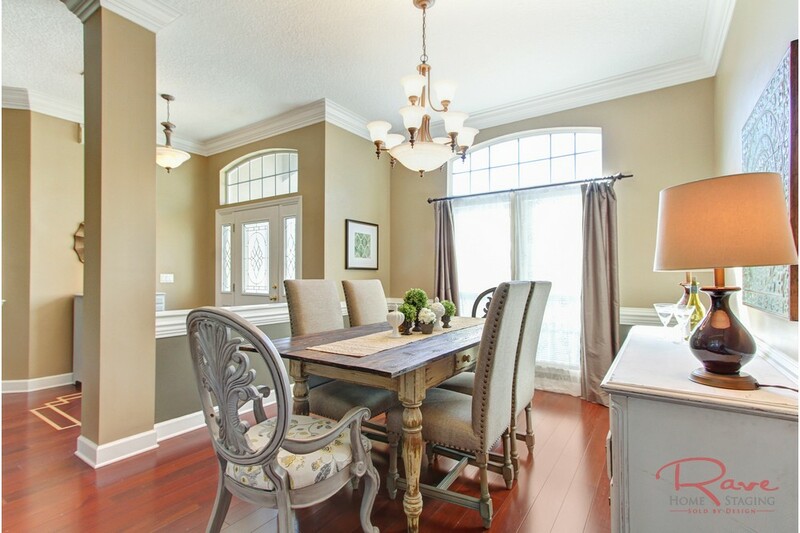 First off, the lead stagers at Rave Home Staging follow a 3 point method of styling each property. First we determine how to work best with the architecture of the home. If the home is contemporary, then we will likely stage with more contemporary pieces. 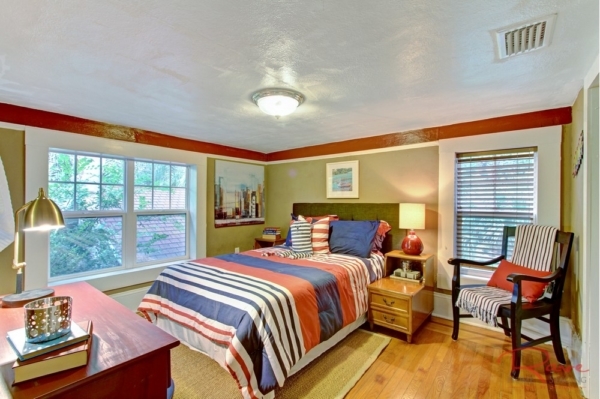 If the home is traditional, then you are likely to see a more traditional style. Next, we determine the demographic of the likely home buyer. How old are they? How old will their children be? 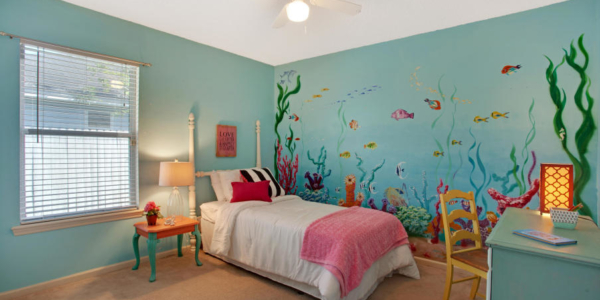 This will give us a baseline on the style of decor that will most likely appeal to the potential buyer. Lastly, we determine the likely psychographics of the potential home buyer. How will they think? What kind of activities are this buyer likely to engage in? We create a lifestyle setting around all of this information. Let’s take a look at how that differs from the previous photograph. Notice how much more seating is in this space than the previous space? It doesn’t feel crowded, but it does feel like the full room has been utilized. How many more people can actually comfortably fit into this room now? 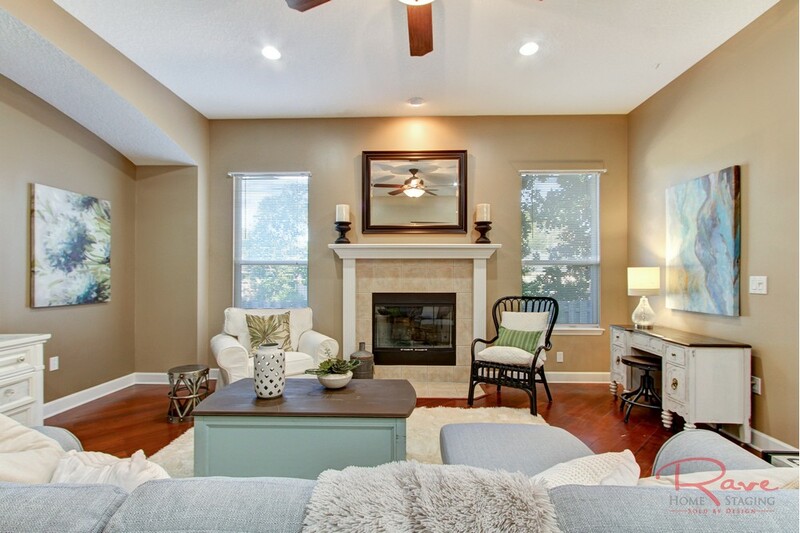 Notice how the large mirror over the fireplace draws your eye to it? There is a clear focal point. The other two large pieces of art seek to balance the scale of the room, while drawing your eye up to the high ceilings. 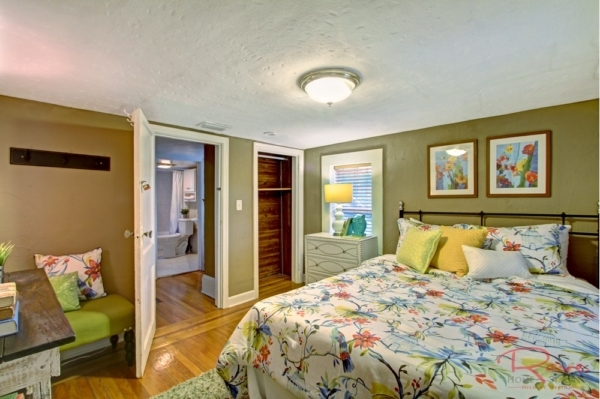 The room pulls out to feel like a larger space. Style of furniture. The rich leather sofa, fur topped ottomans, and modern wing back chairs make the home feel richer, more luxurious. The combination of textures and textiles, wood, leather, glass, warmth, and sheen, create a cohesive space that potential buyers, in this demographic, aspire to live with. The furniture doesn’t feel forced, or formulaic. It feels like a well thought-out designed space. As home stagers, we aren’t designers, we are marketers. As such, we need to understand all of the thought processes and triggers that create the urge to buy. The result is always what is important. 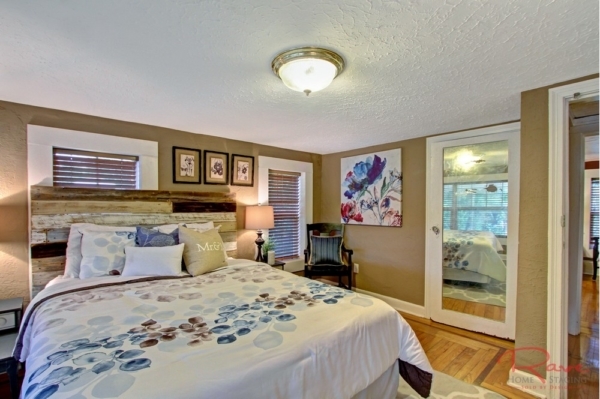 In this case, the home sold in less than a week after switching agents, and home stagers. The BIG DIFFERENCE is not only in time on market, and the cost of maintaining a home of this cost. 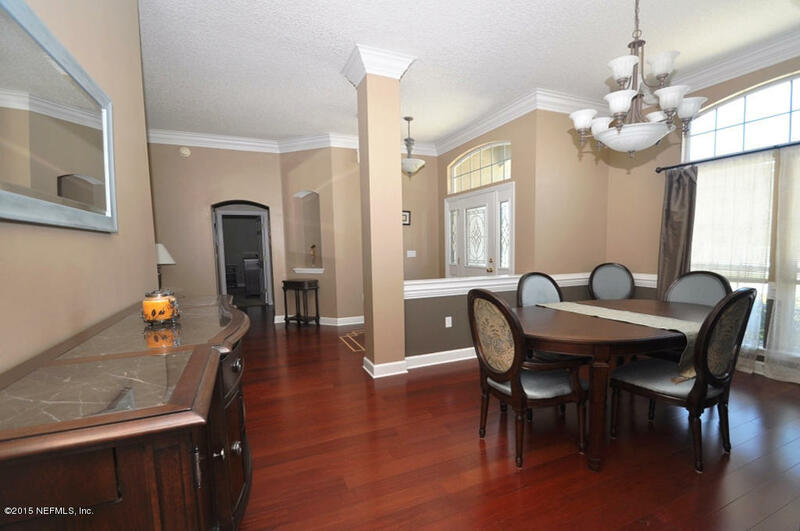 The big change is what a potential buyer would pay for the other house, vs the one we staged. While all of the “bones” are the same, the perceived value is quite different. If you saw both of these homes on MLS, side by side, would you believe they had the same list price? 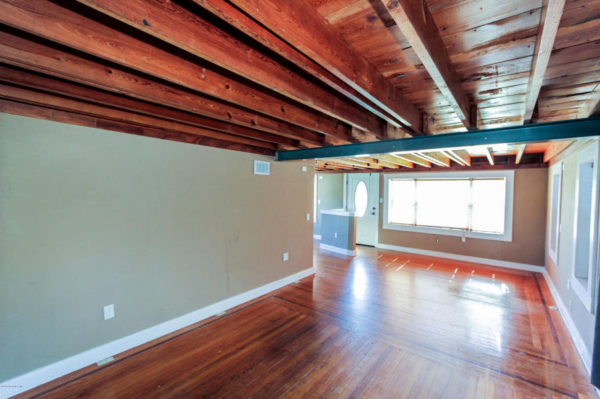 Let’s take a look at another home we were recently contacted to re-stage. 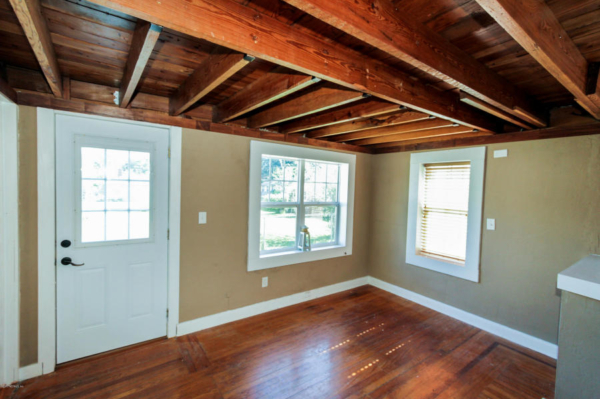 This time, the Realtor suggested that the homeowner hire us, primarily because they had seen the difference in the house above and asked that Realtor about it. The seller, convinced that they had done better research and would get a far superior product, but still spend less money than hiring us, contacted a different company. This was another one of those, stage only the key rooms of the home kind of companies. 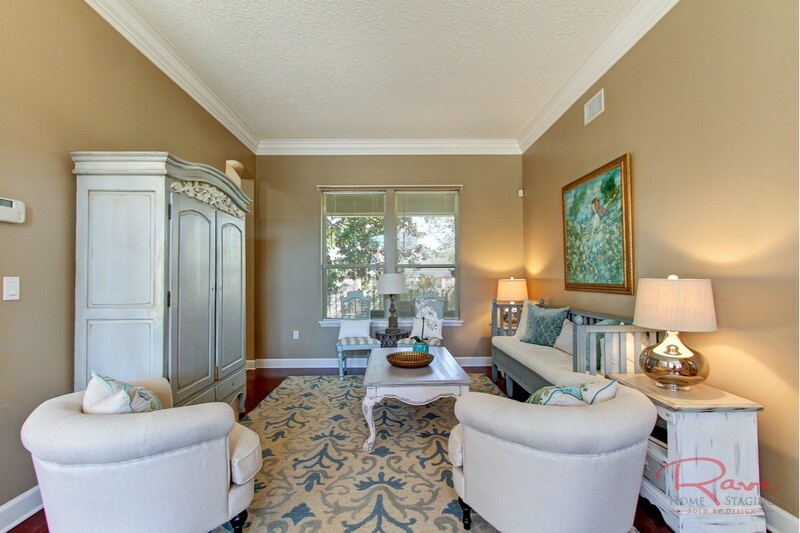 On the surface, this Julington Creek Plantation Home is staged much better than the first home staging company. 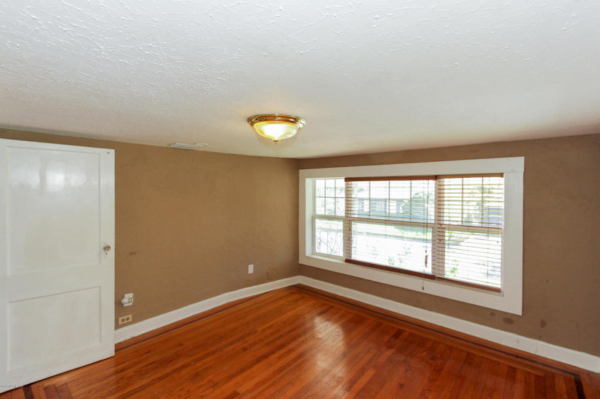 The listing agent contacted us, letting us know that the seller was incredibly upset at the level of staging in this property. They hate the all-white, beachy decor for this neighborhood. 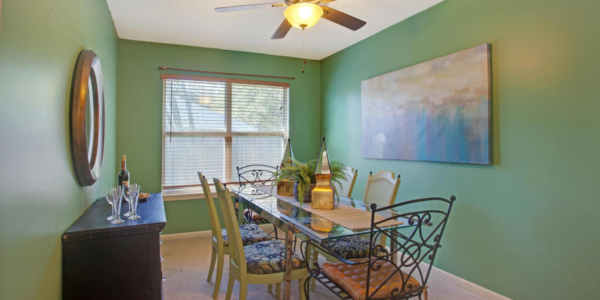 Since this community is a more traditional community, known for A+ schools, family activities, and sports, this style of decor isn’t likely to be too popular among those living here. 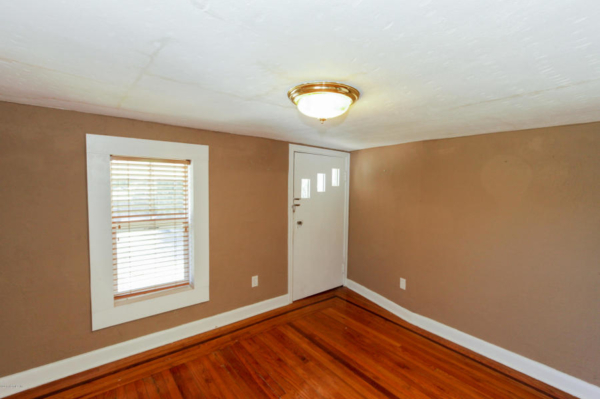 While I would agree with any stager that said that the seller’s stance on “all white” is more of a design decision, there are elements here that made me feel that the stager working on this property simply missed-the-mark. Again, let’s go through them, from a staging point of view, not a decorating one. 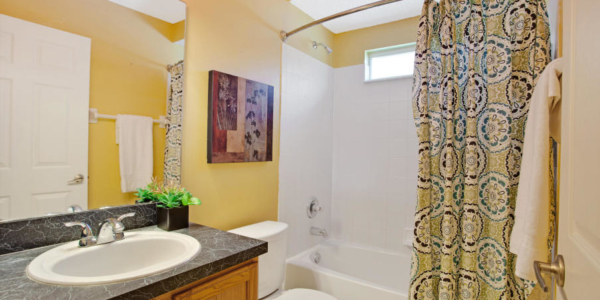 Colors and styles are part of understanding demographics of potential home buyer, and not just decorating decisions. 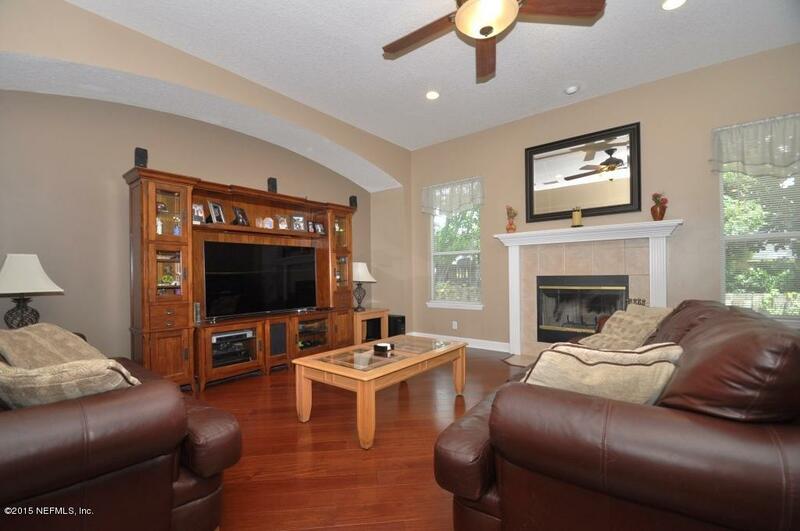 This 4 bedroom, 2271 sqft home doesn’t have enough seating for the family that would live here. 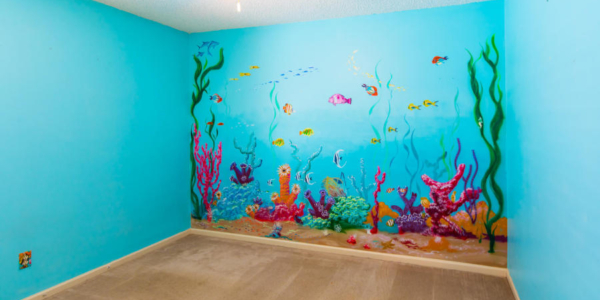 This will make the room feel “too-small” for potential buyers. 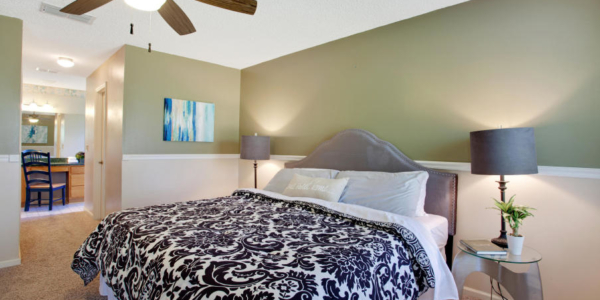 The general rule of seating is always number of bedrooms + 1 (as two people commonly share the master bedrooms) is the minimum number of seating. This living room has 4 seats – 3 sofa seats and one chair. That is one short of the 4 bedroom + 1 additional required. This same objection is carried over to the breakfast area. 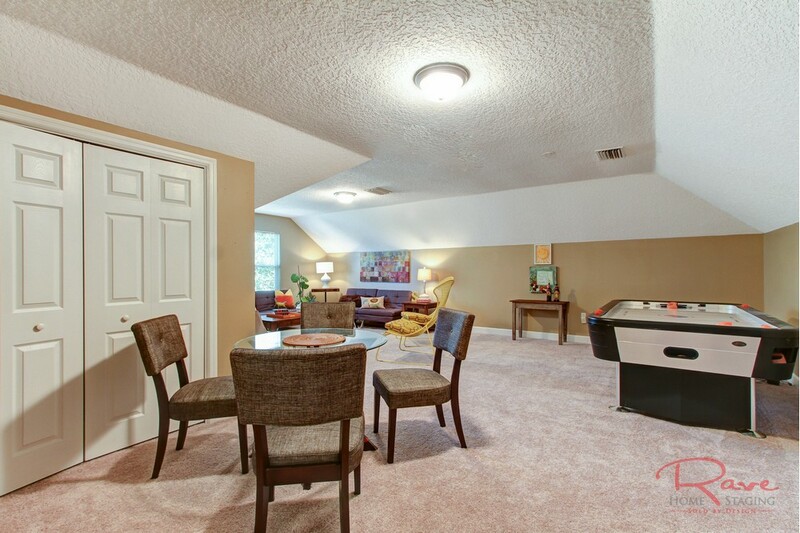 Again, only 4 chairs implies that this living room and breakfast room is only suitable for a 3 bedroom house. Rug on Rug. This is NEVER a good thing. Rug on rug implies there is something hiding underneath the rug, like stains. Dinky table in the TV hole. 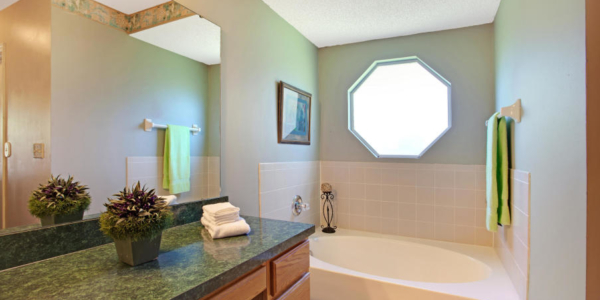 While almost everyone hates the TV holes that were popular in the late 1990’s, early 2000’s, when this home was built. The new buyers will have to live with it and this isn’t showing what to do to overcome the objection of dated architecture. 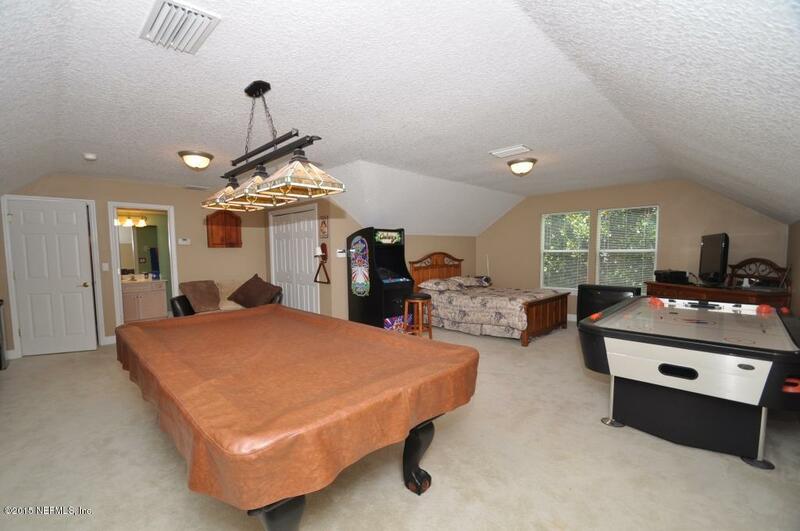 The furniture is appropriate for the price point of the house, except there just isn’t enough of it. 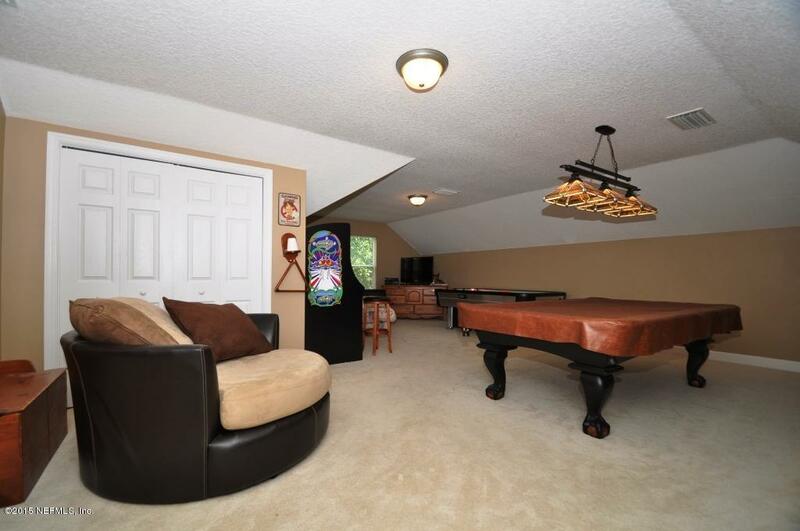 This doesn’t sheepishly imply that there is more room for stuff later, the awkward bar angle and tightness by the breakfast area, implies that it might not all fit, or at least “we didn’t know how to put it there and not look crowded”. 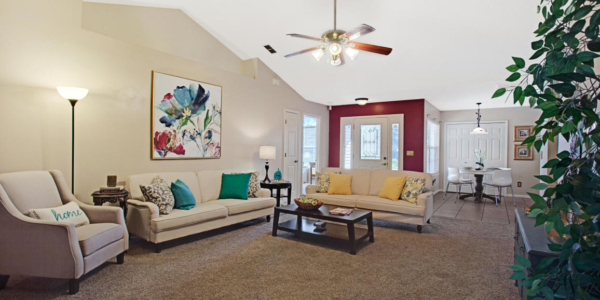 As before, let’s take a look at what Rave Home Staging did with the space after we received the contract, which was immediate by the way. 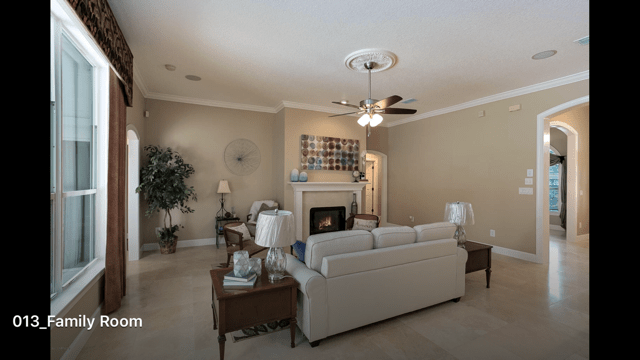 The seller advised us that the staging company was honorable and when they heard about how much he disliked the staging, they immediately removed it and did not charge the full contracted price. We don’t happen to have the same angle of this space, so I’ve included multiple photos so you can see how our version of the room relates. 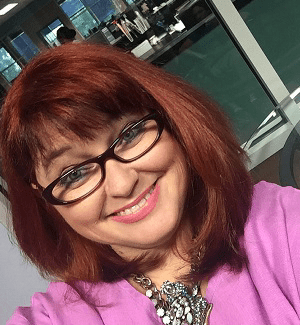 Breaking down the spaces again…. Seating for 6 in both the living room and the breakfast room, without making the room feel crowded. Adding a console and TV in the nook show how the architecture still works for today’s family. Rather than ignoring the empty space toward the back window and simply filling it with a fake plant, we created a small office space for the family. 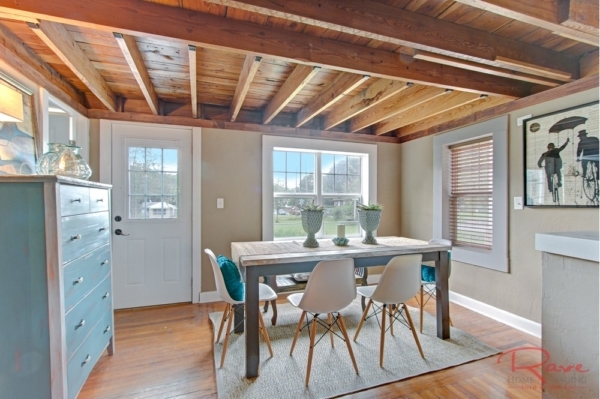 As this is a fairly small home, and office space is important to today’s buyers, we’ve added value where previously there was none. It was dead space. Rich colors, full of texture, art, and design, match the buyer demographic more fully. Once again the space feels full, but not stuffed. 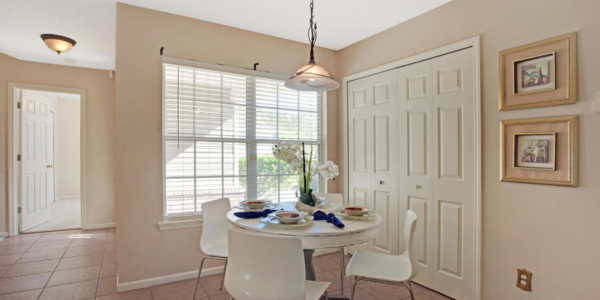 There are clear focal points and the usage of the rooms feel obvious and complete. 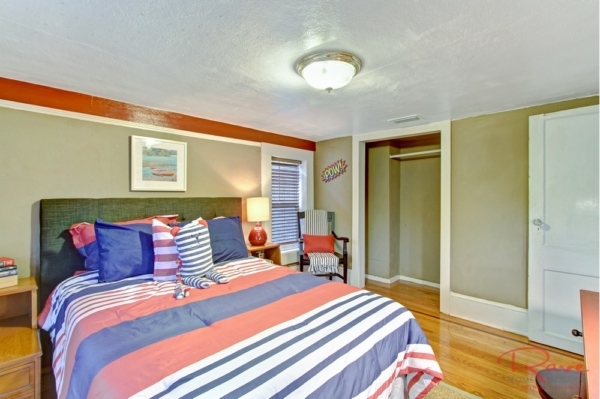 Just as before, if you saw both of these homes on MLS, which do you think would sell for more? 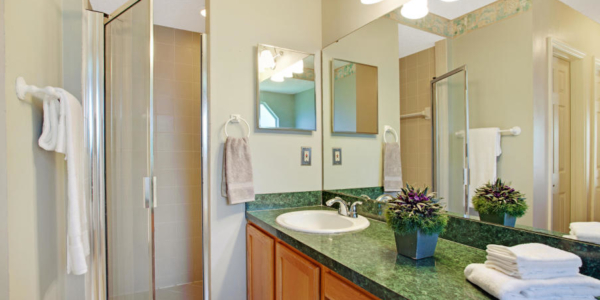 Saving a few hundred dollars in staging costs is not typically the wisest solution when preparing your largest asset for sale. Instead of focusing on what you will spend, focus on what kind of return you would like to see on that investment? Then call the company that will provide that. *** UPDATE ON THIS PROJECT *** This home went under contract in 7 days after being restaged and relisted! Now that is the success we are looking for! Rustic Home Decor. When not enough is really too much! 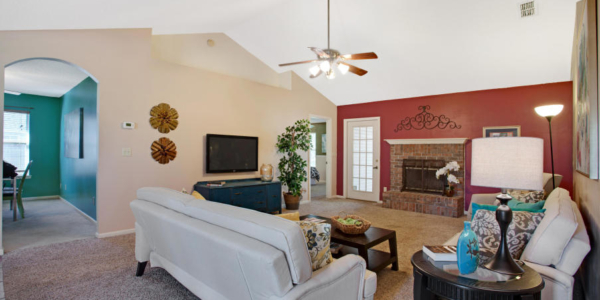 One of the favorite parts about my career, of running a home staging company, is seeing the transformation of properties that really struggle getting market traction. 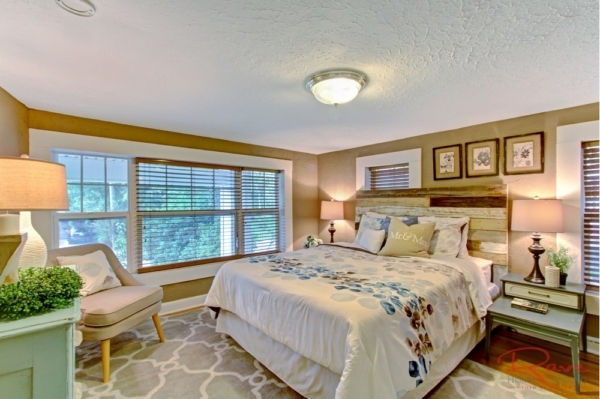 While I feel that nearly every vacant home would present better with home staging, there are some that just simply need it more than others. Today I am going to focus on one of those properties. 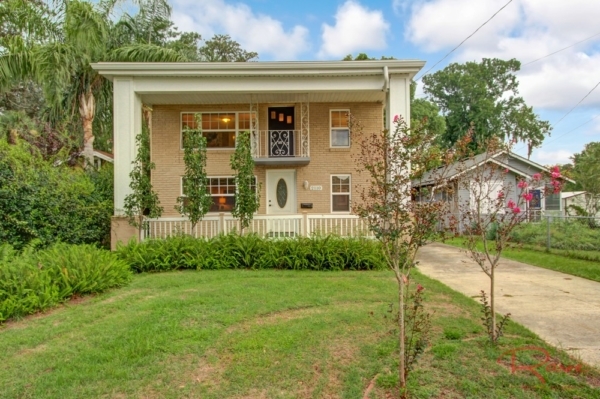 This charming home in the Avondale part of Jacksonville, is less than 1500 sqft. 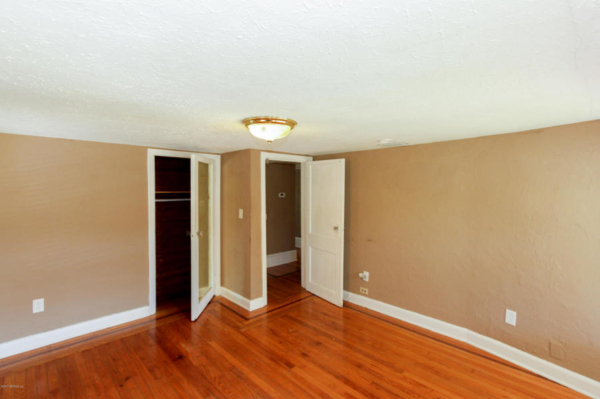 It’s a three bedroom, with one and a half baths. As is common in the Avondale area, it is also full of quirky charm. Unfortunately, that’s sometimes lost on the masses, particularly when the home sits empty. 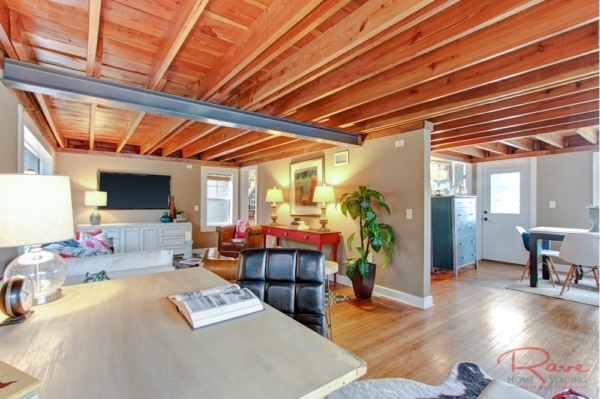 The biggest quirk of this home is that the ceilings are low. When I say low, I mean it too. Since I’m only 5′ tall, this doesn’t present a problem for me at all. Our 7’+ ex-college football player, hunk of a mover, probably constantly felt like he was going to bump his head. Still, Avondale is a great part of town, where lots of artsy buyers go. 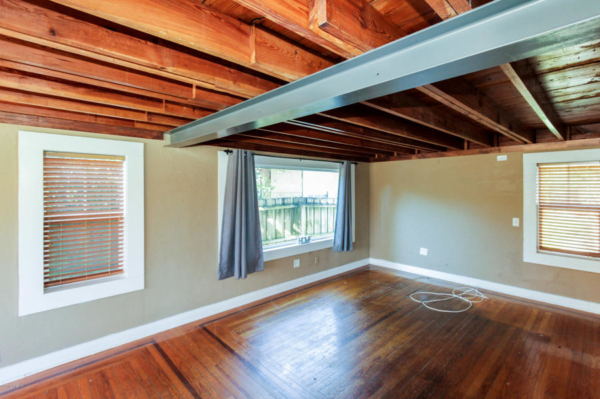 Surely there will be someone who will love this home as much as the previous owners did, and they’ll be short enough to not worry about the lower than normal ceilings. 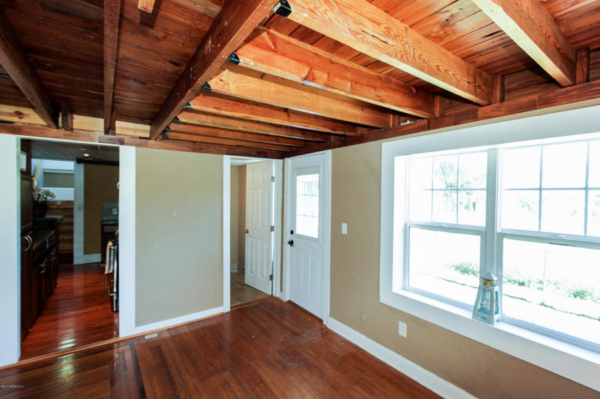 Adding insult to injury, the open beams of this house yell for your attention. Because the ceilings are already low, making them a focal point of photos (and the room) adds to the already awkward situation. What this home really needs is a distraction. We need something else to look at. How about furniture, art, and accessories? So, what do you think about the changes we made? 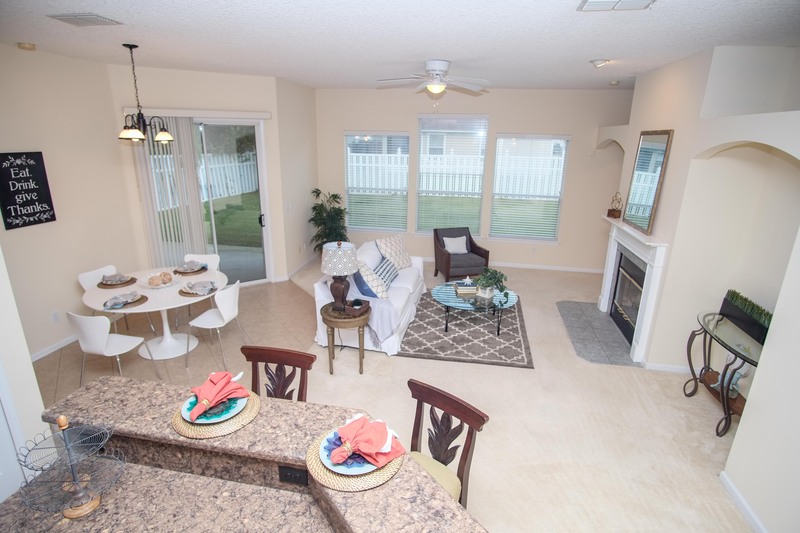 Do you think staging will make it easier for someone to imagine living in this home? Does the home feel more valuable?